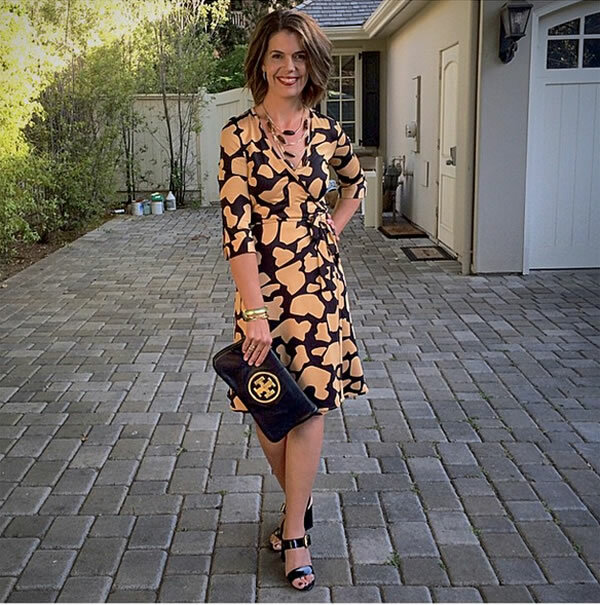 I discovered Suzanne through Instagram when she tagged her photos with #40plusstyle for our weekly style inspiration roundup. I found out later that she had actually been following 40+Style for a while and that I inspired her to start her own blog! Suzanne has amazing style, so of course I wanted to find out more about her. Enjoy. Hi Suzanne. Thanks for taking the time out to answer a few questions for 40PlusStyle.com. Can you tell us a little bit more about yourself? I have always been interested in fashion. I come from a long line of fashionable ladies that include my grandmother who at age 92 is the greatest example of personal style, to my mother and mother-in-law who are always they most fashionable ladies in the room. (You can read more on my Grandmother in this post on the blog) From playing dress-up in my grandmothers closet to learning to sew my own clothing at an early age; fashion has always intrigued me. Not fashion in the sense of keeping up with trends, but in how it makes us feel. I love gorgeous fabrics, texture, innovative design, repurposing vintage pieces into something new to finding that perfect fitting dress which can give that bump in confidence to light up a room! After receiving my BSW from San Jose State I found myself at Nordstrom Inc. where I worked as a buyer, product design executive and later as a store manager for multiple stores in the Northern California area. Once my daughter was born, I left the fashion world for a more flexible career as a Realtor, allowing me more time with my family. Can you tell us a bit more about your blog Ask Suzanne Bell and why you created it? I created the blog as a creative outlet for my creativity. I also had many friends asking for fashion advice who suggested I start AskSuzanneBell. I believe that great style is inclusive, not exclusive and that everyone at every price can have it. I think by offering weekly tips and suggestions, I can help readers find their own personal style. If they need some advice along the way I encourage them to contact me, I love to help women feel confident about themselves. 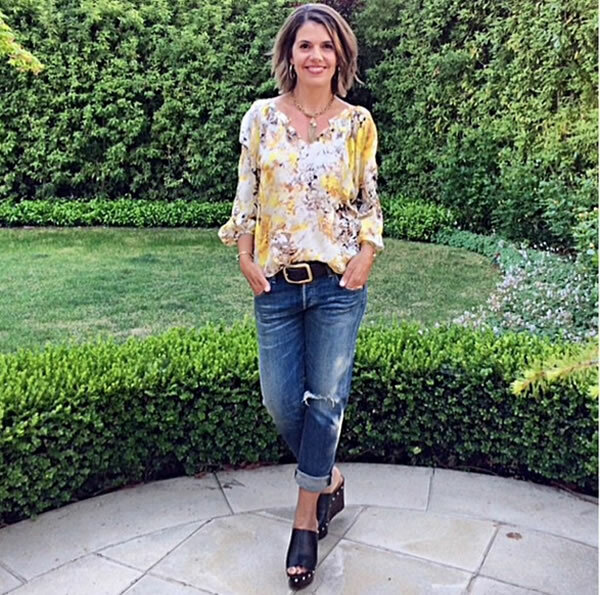 I also have a tween daughter, so I am well aware of the challenges moms face these days in finding age-appropriate clothing for tweeners who are out of the girls department but not quite yet ready for women’s clothing – this led to the creation of the “Tween Style” component on my website. My husband and I flip homes as part of our Real Estate business so I added a “Home Makeover Portfolio” to showcase some of the homes that we have renovated – to inspire homeowners looking to give their personal residence a makeover. I have always been an eclectic dresser. One of the reasons I used to sew my own clothing is I couldn’t find unique quality pieces that I felt expressed my own personal style. I remember at 15 I bought a red thrifted bridesmaid dress, took it apart and then sewed it back together to make it more “me” – I love being original! Now, I follow trends but I always look to make them my own. I mix and match pieces – I am not brand or trend specific. 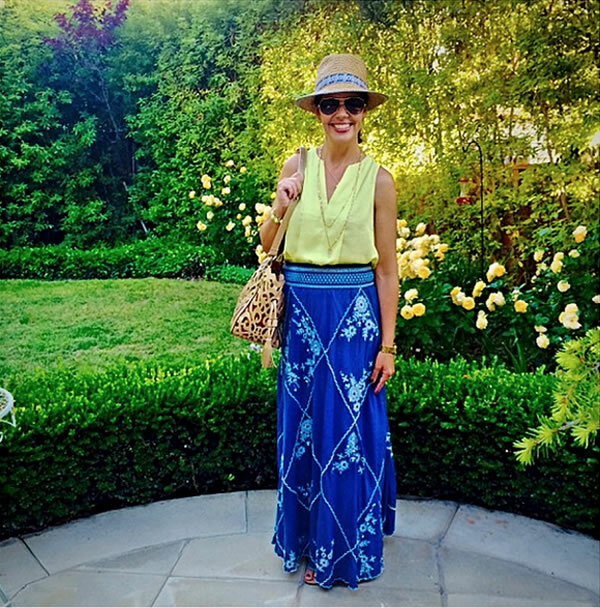 I shop everywhere from Neiman Marcus and Nordstrom to Target and Ebay – I buy and wear what I feel expresses who I am. I like unique pieces. I don’t want to look like everyone else. I look for fun pieces; classic with a bohemian twist. Fit and comfort is key. I am a big fan of alterations – a poorly fit garment no matter how expensive, doesn’t look or feel good. Sky-high heels may look fab but if you can’t walk in them, your confidence won’t shine through. I invest in staples but add low cost trend items to mix things up. I live in Northern California so layering is key. The style in Silicon Valley is very relaxed. Most of my daytime outfits are denim based, though I do love maxi dresses. When I start with either of these base items, I can layer on a jacket and scarf in the morning and peel off layers as the temperature rise in the early afternoon. For work, I stick with black, that way all my layers work together! Classic Bohemian if that makes sense. I love mixing wild bohemian pieces with classic pieces. For work, I have to dress fairly conservative, so on my off days I prefer to dress a bit more free-spirited. I am a sucker for premium denim, unique shoes and a DVF wrap dress. For cocktail hours I lean towards black sleek dressing with fabulous jewelry and statement shoes. I love lipstick! How I feel in the moment, and of course the weather. Color profiling –no. I love certain colors and I stick with them, regardless of what is trending or what a color chart tells me I should wear. My closet consists of black, white, charcoal grey, taupe, denim with pops of orange, burgundy, gold and yellow. These colors make me happy so I stick with them! As far as body type – definitely. Wearing a style that doesn’t work for your body type is like wearing a garment that is too small. I am short waisted so drop waist styles are best for me. I also have narrow shoulders so I am best in halters and tanks. Swimsuits? My torso is too long for one-pieces so that’s just not happening. You need to know what works for you and highlight your assets – it will boost your confidence. I also am a fan of altering items to fit my body type. I really wanted a shirtdress this season, but they all hit me in the wrong spot. By dropping the belt loop down 2”, I created a custom shirtdress that worked for my body type for a mere $5.00! Yes, I care less about what others think and dress in what makes me feel good! I create my own trends vs. following others. My grandmother is 92 and shops at Anthropologie! If you feel good, you look good. Who cares what others think? If you like it – rock it! I feel I am more creative and take more risks than ever – now I dress for me, not for anyone else. I do follow trends, but I adapt them to fit my wardrobe and lifestyle. Right now, I love all the new trends in denim. I am tall, so flares and bellbottoms work for me. 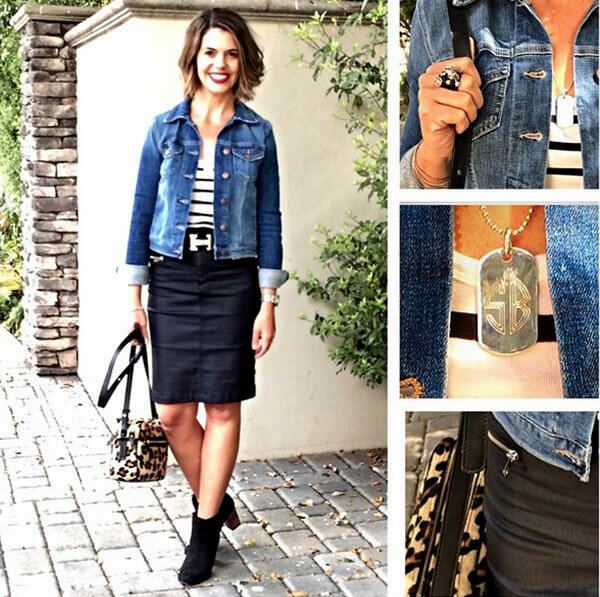 I am loving denim on denim, as I didn’t get into this trend the first time around. I also love all the different pant lengths. Wide leg crop styles show off your shoes and I love fun shoes! Jumpsuits are fun. Who knows? Maybe a denim jumpsuit! Know your body type and what looks good one you. Find your own personal style, figure out when you feel at your best, then build on that style or look. Don’t be afraid to mix and match trends. Create a buildable wardrobe and house your collection in a well-organized closet. Clean your closet seasonally or at least twice a year. By the time we are 40, many of us have collected a lot of stuff! If you haven’t worn a garment in a year, consign or donate it. If you can’t bear to part with it, put it in storage for a year and see if you miss it. The key to putting yourself together each morning is having a fun place to play dress-up. We get dressed everyday, why not have some fun with it? For now, I plan to continue to have fun with it and challenge myself to produce fun, informative pieces for readers twice a week. I hope to inspire ladies to try new things, have fun with fashion and express themselves through discovering their own personal style. Down the road I would like to add a community component where readers can interact with AskSuzanneBell, I think we can learn from and be inspired by each other – I hope to be able to create this type of environment in the future. I would just like to thank you, Sylvia for creating the fabulous 40+ Community! Your blog was an inspiration to me before I started AskSuzanneBell and continues to inspire me on a daily basis! 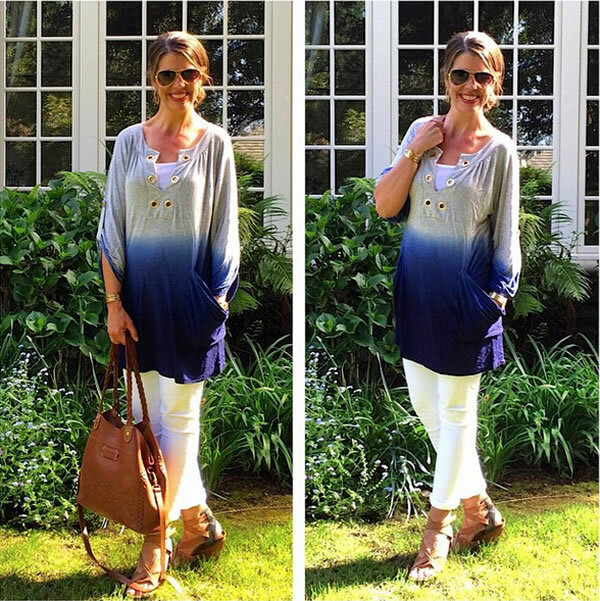 For plenty more style tips and fabulous looks, be sure to visit Ask Suzanne Bell or follow her on Instagram! Which of Suzanne’s outfits is your favorite? Well, there is a bloggers meet up in Vancouver at the end of July…. Suzanne, Sylvia and I will be there. Ok Greetje, how fun would that be? You’ll have to hold me a spot for when my kiddos are a bit older 🙂 Have fun! 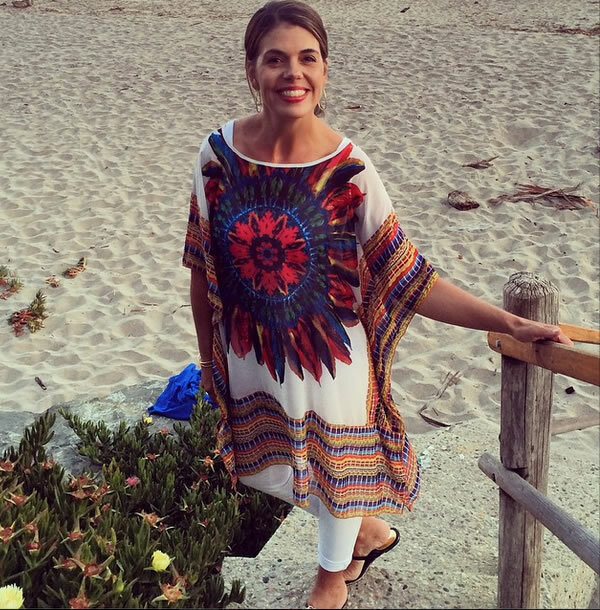 I love your boho vibe – it’s my chosen style of dress too! You looked gorgeous in every way. You have great taste in fashion and unique style that is envious to others. Thank you for showcasing Young Villagers’ leather handbag in few of the pictures you posted. Love to have you as a customer. I am so glad, you found and introduced Suzanne to us, Sylvia! I adore her style and would wear everything in a heartbeat! Really cannot decide on my favourite look as they are all fabulous! Suzanne is one of kind… when she was a little girl she made a wedding dress for her Barbie with a really long train, out of toilet paper….her energy comes from helping others and finding inspiration in the art of fashion…her success is in never forgetting where she came from and pushing ahead no matter what…she is more than a pretty face and has a big vocabulary…and a bigger heart! 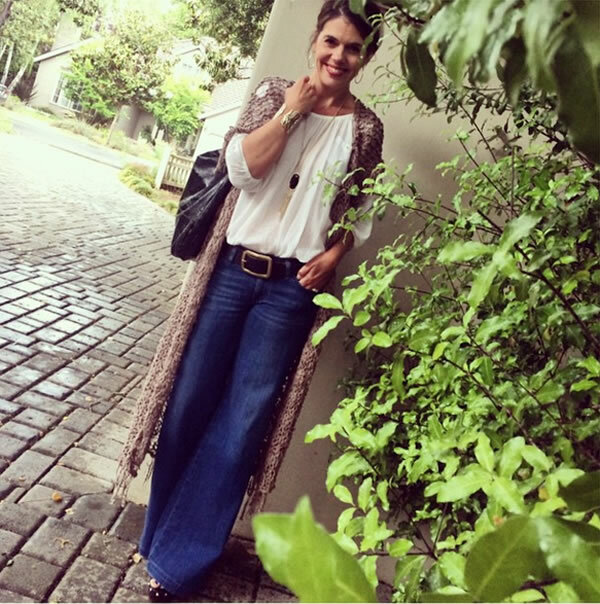 Her blog is full of fresh ideas …and her specialness is in really wanting her readers to feel confident and comfy stepping out the door… at any price….it is about style and it is about who you are. Staying true to what grows on you over time…I have known her from the beginning… you guessed it ,I am her Mom!!!! Awe Mom, thank you! I had great examples in you and Gram! Beautiful clothes in a style that really resonates with me. I’m definitely going to have to pay attention! Love Suzanne’s style she is so darn cute. Thank you for sharing her blog with us. I always love your style interviews! This one too is nice. An interesting woman with great style! Thanks. Hi Anja! Thank you for taking a look! I love Syliva’s interviews as well and was excited to actually be a part of one! Next post: Brand focus: Porto & Inizio – Be stylish AND comfortable!